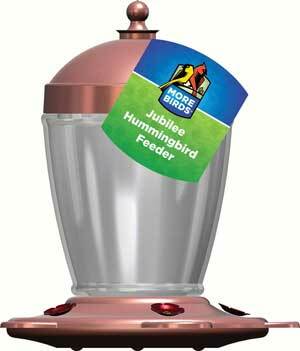 Jubilee Hummingbird Feeder. Glass and Brushed Copper. This Jubilee Hummingbird Feeder features a glass bottle and a brushed copper base with a large 32 ounce capacity. Glass bottle with brushed copper top and base. Add elegance to your yard. Wide mouth bottle is easy to fill and clean. Large 32 oz. capacity ensures plenty of nectar for hungry hummingbirds.